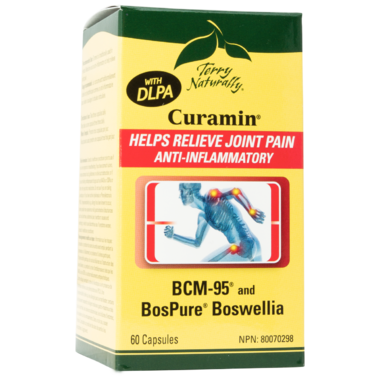 Curamin® with DLPA features a unique PATENTED curcumin blended with turmeric essential oil containing turmerones. Turmerones are naturally occurring compounds within the essential oil. Turmerones not only increase absorption of curcumin but have the same clinical effects as curcumin. Turmeric is (traditionally) used in Herbal Medicine as an anti-inflammatory to help relieve joint pain. Directions: Take three capsules daily. May take as one capsule three times daily. Non-Medicinal Ingredients: Hypromellose, Silicon Dioxide, Magnesium stearate. Caution: Consult a healthcare practitioner prior to use if you are pregnant or breastfeeding, if you have stomach ulcers, excess stomach acid, gallstones or bile duct obstruction, or if you are taking antidepressant drugs such as MAOIs or SSRIs or other anti-psychotic medications. Do not use if you are taking Levodopa or if you have tardive dyskinesia or Pheylketonuria (PKU). Hypersensitivity (e.g. allergy) has been known to occur, some people may experience mild gastrointestinal distubrances such as diarrhea, abdominal pain, heartburn, nausea and vomiting; in which case discontinue use. If symptoms worsen, consult a healthcare practitioner. To be sure this product is right for you always read and follow the label. This is a wonderful product, I have chronic joint and ligament issues. I only wish that Well.ca would keep more than 1 bottle in stock!!!! It's not like I can go walking out to the store anymore!!!! Please, please stock this........I've signed up to be notified, too. Sorry to sound so pathetic, but this really really makes a difference. Thanks.